I am pleased to announce the addition of strokes gained functionality to US PGA Tour events on Golf Predictor. This new feature was suggested by a user (although I was already considering it!) and is available from the new Rankings (Strokes Gained) page on the Predictions menu. Strokes gained stats are a relatively new PGA Tour initiative and are calculated from the mountain of data produced by ShotLink. Unlike most other tour stats (e.g. driving accuracy, GIR etc), which largely cancel each other out, strokes gained stats are widely regarded as the most accurate in judging a golfer's performance relative to his peers. The average number of shots the tour pros take to get into the hole from a variety of distances is calculated and each golfer's performance is compared to that average value to produce a positive (better than average) or negative (worse) number for every shot. These numbers are added up at the end of a round and the field average is also factored in to produce a total strokes gained number for each player for the round. This total strokes gained is currently broken down into two main categories: strokes gained tee to green and strokes gained putting. These two categories together show the long game and putting prowess of the golfer and if you add them together, you get his total strokes gained. 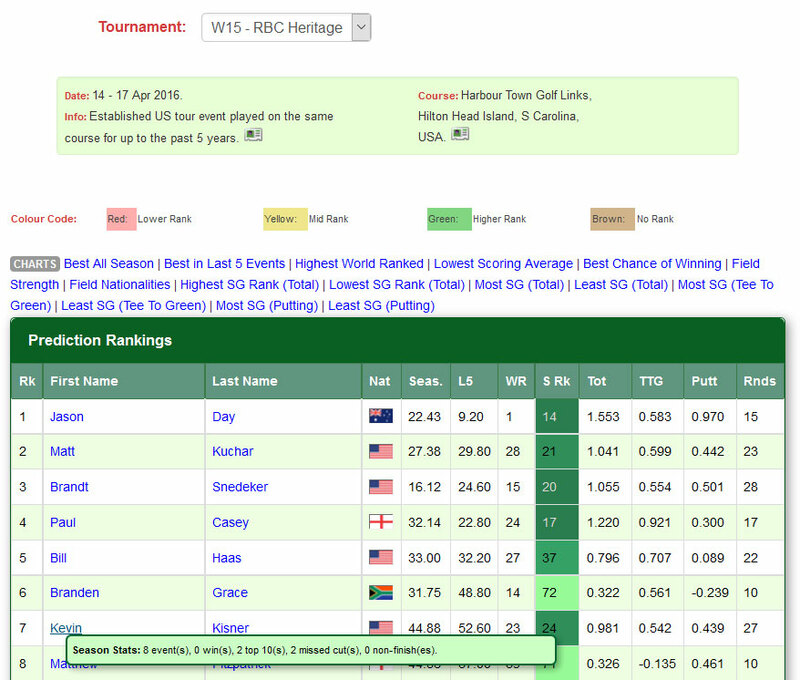 A snippet of he new Rankings (Strokes Gained) page can be seen in the first screenshot above for the 2016 RBC Heritage. The new columns are the rank in total strokes gained on the PGA Tour (S Rk), total strokes gained (Tot), strokes gained tee to green (TTG), strokes gained putting (Putt) and the number of rounds these stats were calculated over (Rnds). As shown above, the rank in total strokes gained is colour coded, with colours from green to yellow to red used. Green shades represent good rankings and red shades represent bad rankings, with deeper shades representing better/worse rankings. Yellow represents mid rankings from the roughly 210 golfers on the US PGA Tour with available total strokes gained stats every week. For tournaments with these new stats, a new Strokes Gained panel has been added to the 'Prediction Data' page for each golfer. This new panel is directly above the panel with links to the golfer's tour stats pages and is shown in the second screenshot above for Jason Day, also for the 2016 RBC Heritage. If a golfer is not in the list of the roughly 210 golfers with strokes gained data that is made available by the US PGA Tour each week, all his strokes gained data will default to 'n/a' on the new Rankings (Strokes Gained) page. If the golfer is not in the weekly list, the new Strokes Gained panel on the Prediction Data page is hidden for that golfer. UPDATE: see note under this post for change to this. Remember that some golfers with rankings for total strokes gained will not be in the field on any given week. For example, this may mean that a golfer with a ranking of 10 for total strokes gained may be the best in the field if the nine golfers ahead of him aren't playing that week. The strokes gained in each category (total, tee to green and putting) are all shown as per round averages, i.e. the stokes gained in each case divided by the counting rounds. I plan to leave the strokes gained information in the system until the end of the GP season, after which it will be deleted and replaced with the data from the new season. This strokes gained information is only available for US PGA Tour events from the 2016 Masters on. On Golf Predictor, this corresponds to tournaments with a Tour value of "US" or "Both". Further to the above point, all matching tournaments for the current season with this strokes gained information are automatically shown in the Tournaments dropdown list, regardless of whether it is a US only event or is on both tours. Due to the above points, you can not change the tour or season dropdown values on this new Rankings (Strokes Gained) page. It will always just show the current season US PGA Tour events, so there is no need to change them. They are there for display purposes only. Strokes gained stats are calculated based on the wraparound US PGA Tour season, while Golf Predictor season stats are calculated based on the GP Season (calendar year). As this new functionality increases my weekly workload, it may or not be available for some or all future tournaments. If enough people find it useful, I'll do it for as many tournaments as possible. Otherwise, I may just do it for the bigger events. When available, the strokes gained data will appear on the Monday or Tuesday of the tournament week, depending on the availability of said information. A colour code table is displayed on the new Rankings (Strokes Gained) page, as shown in the first screenshot above. It appears that some tournaments are not counted for strokes gained purposes, e.g. The Masters. Most golfers have the same stats as the previous week, although Danny Willett and Rafa Cabrera-Bello have entered the list. I'm not certain what's going on there, but I can only go by what's on the official list each week! Strokes gained stats are not available for the European PGA Tour. You may have to refresh a page, e.g. the golfer Prediction Data page, to see the changes. The first four charts above are in the new Strokes Gained panel in the Prediction Data page for each golfer and show the progression of each metric through the current GP season. The eight remaining charts are on the Rankings (Strokes Gained) page and pick out the best/worst golfers for each metric in the tournament field. Note that the strokes gained only started in Golf Predictor for The Masters. Also, total strokes gained (rank) and total strokes gained for a tournament are equivalent, since the highest rank (1) is the highest total strokes gained and so on. These charts bring the total number of charts on the site to 475. I trust you will find this new premium strokes gained functionality useful. Any feedback (via comments on this article or email) would be most welcome. Like other premium features, non-subscribers can only see this strokes gained information for golfers ranked 11-25 in the prediction rankings. Also, only subscribers can see the strokes gained charts on the new Rankings (Strokes Gained) page. Therefore, sign up today and reap the full benefits of Golf Predictor, the premium professional golf statistics site. I've changed the display of the strokes gained panel slightly. Now, if the golfer for a US event since the 2016 Masters has no strokes gained data, the panel is shown with a message to that effect. Until now, the panel was hidden for such golfers. I've added a great new field strokes gained chart. Read all about it here.